I finally thrifted a needlepoint belt and thought I’d really scored (since all that handwork can run $100-200, pricey for an accessory most men hardly give a thought to). The perfect inspiration to get around to that blog post about them! But the more inspired I became looking at all the needlepoint belts online, the less inspiring mine was. My big find featured dark and muted colors in a simple geometric pattern. Yes, the hand worked surface of the needlepoint belt is the obvious draw. But the color, pictorial patterns, whimsical themes and detail is what transforms the brown leather belt taken for granted into a personal and sartorial statement. And the above favorites of mine from Smathers & Branson have all that and more! As a prep classic, many of the retailers you’d expect have carried their own needlepoint belts—Brooks Brothers, Ralph Lauren, Lands’ End—but Smathers & Branson seems to stand out as the best of the best, especially in design. 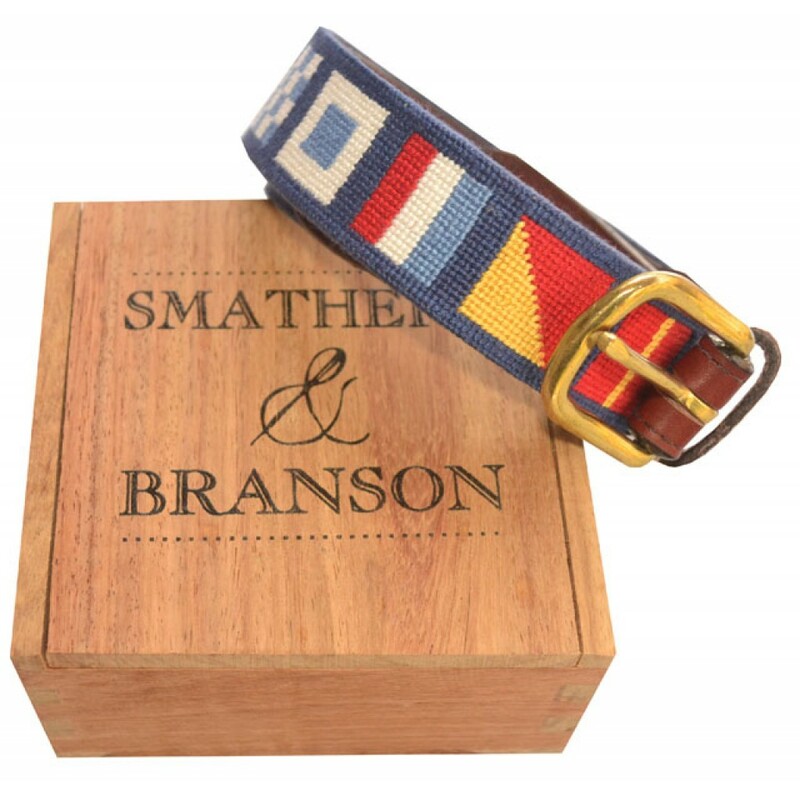 Plenty of savvy labels like Club Monaco and Opening Ceremony have carried Smathers & Branson belts too (often in exclusive designs), but why not go right to the online source. Another big online purveyor, Tucker Blair, is a respectable and very value-oriented alternative (about half the price of S&B). Or you could wait to thrift one–I’m on the hunt again after my crash course. 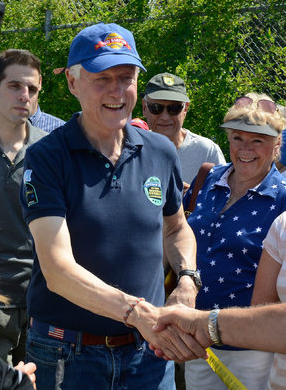 A couple Post Scripts–After a chunk of the day sifting through needlepoint belt jpegs, the Smathers & Branson American flag belt is the first thing I noticed in a photo of ex-Prez Bill Clinton shaking hands in the Hamptons in just yesterday’s Times (detail of a Doug Kuntz photo for the New York Times below). Here I was worried it was getting a bit late in the summer for posting about preppy belts. And the Times hard hitting needlepoint belt coverage doesn’t stop there. Its Fashion & Style article from Summer 2010 also gives a lot of love to Smathers & Branson and a little history of the needlepoint belt if you’re interested.